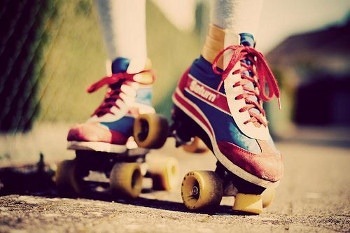 You might be noticing a theme lately, with all my roller-skating related posts, but only because I find it so fascinating! Who knew flying around a track on eight wheels would be so much fun and such a great workout? As part if my training for the Windy City Rollers they recommend we attend one or two two on-skate practices per week outside of our league practice. I went down to one of the qualifying classes at Fleetwood, a Speed Skating class. I arrived a little late and not knowing what to expect, I was surprised to see a mix of quad- and inline-skaters ricocheting around the track at what seemed like 50 mph! I thought, damn, how am I going to keep up with them? 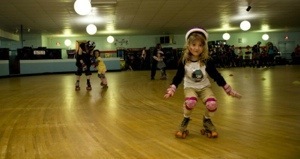 Luckily they had a beginner line and I was able to keep up the pace… With the kids! 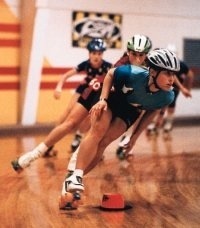 I learned a lot about skating techniques for speed, including crossing over and scooter-pushing. By the end I was able to keep up with the adults a little better. We did a lot of endurance drills too! I left feeling tired but happy. It was a lot of fun! If you have a skating rink around you see if they have a speed skate team; they’ll usually let in anyone whose willing to pay even if you’re a beginner!